This post is a continuation of PART 1, so if you haven’t read that blog post yet, I recommend you start there! This post, PART 2, focuses on more of the day-of logistics for a workshop, and provides additional insights on all the details you might not think of when planning a workshop. PART 1 focused on a lot of behind the scenes details that you need to get in place before selling tickets for your workshop. 7. Create space in your workshop budget for sips & snacks. You don’t have to go overboard with sips and snacks, but it’s definitely a courtesy to provide something for your attendees! I generally bring La Croix and/or Coke and water bottles (having a bunch of water bottles never hurts because you can use them to fill water cups for rinsing nibs or brushes). Then I tend to gravitate toward simples snacks such as cheese & crackers with some sort of sweet! Whether or not people eat at your workshop is a total hit or miss. I’ve had attendees clear out my snacks before, and I’ve also had people not touch them the entire time (I contribute this to the weird group-think phenomenon). Anyway, I see sips & snacks as something that nicely elevates a workshop because it’s an additional layer of hospitality and it makes people feel cared about! Just don’t forget to set aside money in your budget for this; I would plan about $50 to be safe, because you also need to bring plates and napkins. 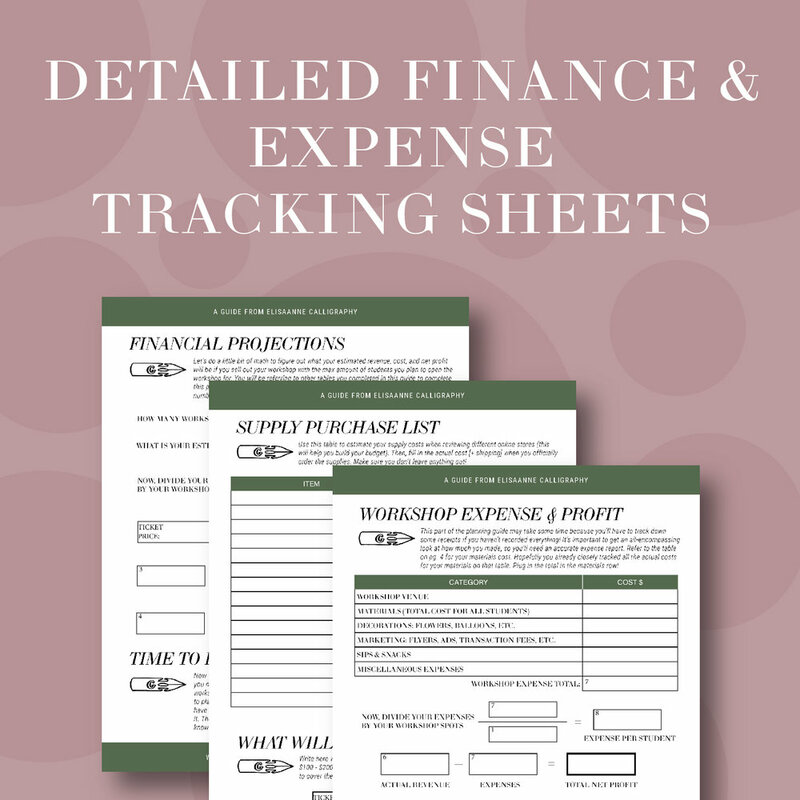 Want help budgeting for your workshop and calculating financial projections? Grab my Calligraphy Workshop Planning Guide! It includes everything you need. 8. Gather any decorative items you want to take to the workshop. I tend to have 2 decorate elements in my workshops: first, I have a roll of kraft paper that I use to cover all the tables. You can never guarantee the condition of the tables a venue has, so the kraft paper is the perfect way to cover scratches, stains, and just all-around ugly table tops. Then, I love purchasing flowers from Trader Joes and making my own flower arrangements in large mason jars that I got from Kroger! Yes, this is a time consuming part of the process, but also a very creative and stress-free part of the process for me. I really enjoy it, and it makes the workshop space even prettier. Plus, the guests love taking photos of them with their calligraphy practice sheets. I spent about $50 on flowers for sure, maybe even a little more depending on how I’m feeling! Just remember, you’ll have to be extra careful transporting flowers with glass jars & water to your workshop venue! 9. Shop for any extra items you need for the workshop. There are always little extras here and there that you might need, like plates & napkins for snacks, cups for water or drinks, silverware (if you need it), tape, scissors, etc. Don’t forget to make a list of all the things you’re going to need. 10. Create an “emergency” bag full of back-up items and extras. I always create an emergency bag for my workshops. You never know when a student’s pen holder will break or, god forbid, you forgot to put on in their kit in the first place. I tend to pack a few extra pen holders, extra ink (for if anyone spills), paper towels, nibs, and anything else I think I might need as backup. This bag is super important because it gives you peace of mind that you’ll be prepared no matter what happens! 11. Transport all items to & from the workshop, and consider time you will need for setup & strike. When you book a venue (which I touched on in PART 1), it’s important to remember that you will need at least an hour to set up and at least 30 minutes to strike everything once the workshop is over. If you can get a friend, spouse, or family member to help you with this, even better! I can usually manage all of this by myself since my kits are in boxes that are easy to place at each attendee’s spot. The key is making sure you transport everything safely, and you have a enough room in your car! 12. Conduct the workshop (the most important part). One of the most common questions I get about workshops is “how” I teach them. Do I use a projector or some sort, or overhead? Nope! But I do use a simple standing whiteboard that I purchased at Hobby Lobby. This allows me to draw and demonstrate a few things in front of the class, like drawing out a nib so we can identify all the parts of it and how far they should dip it into the ink before writing. However, I definitely don’t reply on this whiteboard as my only teaching tool. Most of the time I’m teaching I’m walking around the room and checking up on attendees individually! It’s really important to tell the students at the beginning of the workshop that you are willing to help them as much as they need and answer any/all questions they have. People ask me questions about practicing calligraphy, but they also ask me business questions and behind the scenes questions about working with clients, which I’m always more than happy to answer as well! I also let my students know that I understand some people love having help, but others love figuring things out on their own (I am personally the later type). While one student might not care that you take their nib & pen holder from them to demonstrate something for them, another student might hate that. Just make sure you disclose to them that they should let you know how they prefer to learn! Turn the workshop into a communication and collaboration just as much of a teaching session. Before you host a workshop, I highly recommend creating an outline for exactly what you want to say/teach, and then practicing it at home a few times. I practiced mine at least 3 times before my first workshop, and I even made my husband be my test student so he could give me feedback! 13. How to address problems that may occur during workshops. Workshops don’t always go smoothly… Just ask my friend Cami ;) She said she spilled an entire pitcher of water on her dress during a workshop once and had to teach the rest of the class soaked wet! There was nothing she could do, she just had to keep moving forward and work through it. Knowing her, I’m sure she handled it super well! Workshops are very intimate, and it’s easy for people to get intimidated or discouraged easily. I’ve had students leave early before. Even though they make excuses why they are leaving early, it’s usually easy for me to tell if it’s because they were discouraged and didn’t feel like they were doing well enough. To try to avoid this, I make sure to talk about my calligraphy journey and tell them how far I’ve come. I bring examples of some of my very FIRST work, and then I also bring examples of my current work. I instill upon them that becoming proficient at calligraphy and finding your own style can take years and many, many dedicated hours of practice. I never want a student to feel like a failure. It’s important to continuously encourage each and every student, and also be aware of the fact that calligraphy can be done many different ways. Cater to each student’s needs! Every person will want to hold their pen & nib a little differently, as well as angle their paper slightly differently as well. Help them find what works for them. If any other problems occur during workshops, it’s crucial that you can problem solve as fast as possible. During one workshop I forgot to prep a few nibs for students. Thankfully, I was at a coffee shop and they sold matches! I ran upstairs to grab a pack of matches (which I then paid for later) so that I could prep my student’s nib for her. If I didn’t have that solution, I would’ve had to come up with something else. But now I always carry matches and a potato with me just in case ;) In fact, it’s become really fun to include little baby potatoes in my student’s kits so they can prep their nibs themselves! Have you encountered any other problems? Drop them in the comments below, I’d love to help you out! 14. Common Sense “Do’s” & “Don'ts” for Workshops. Have students introduce themselves to facilitate connection. Offer to bring people snacks and drinks to their spot. Tell students where the bathroom is in case they need to go! Encourage students to take photos and tag you on Instagram. Take photos of your students to share to your Instagram stories. Allow plenty of time to practice! Sit to the side and look at Instagram on your phone. Rush students to finish right on time (I purposely build in extra time). Whew! That’s a lot to think about when it comes to hosting workshops. But seriously, hosting workshops is not something you should do just because you want to make “easy money”. Workshops are great for networking and making local connections, but they aren’t always a huge money maker, especially if you’re not good at tracking all of your expenses. I’ve created a resource that you will probably find super helpful if you’re reading this blog post! It’s called The Calligraphy Workshop Planning Guide and it is the go-to resource for planning a workshop. 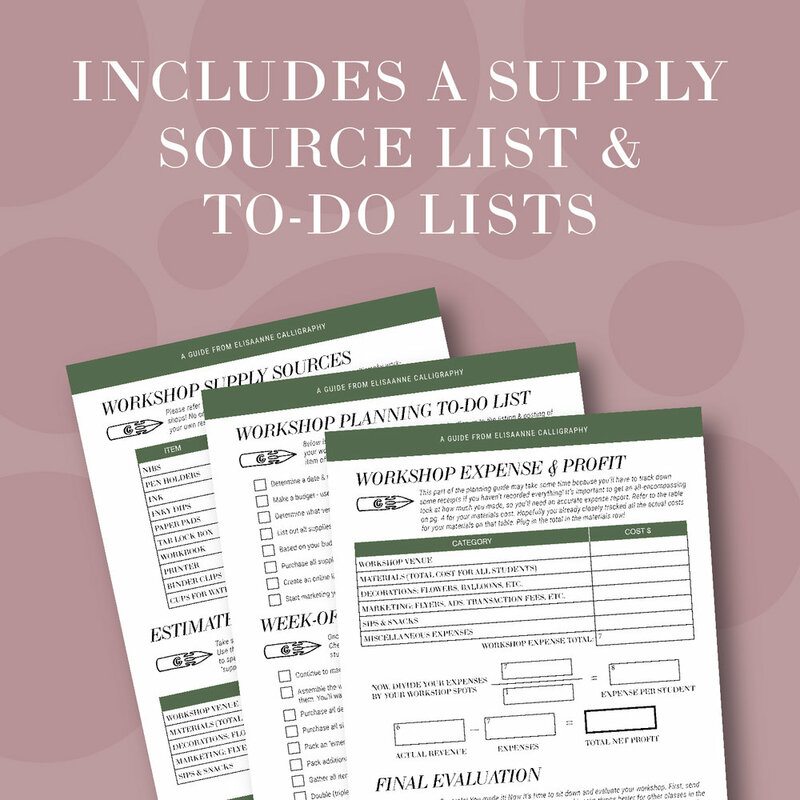 It’s a 10-page workbook that includes a pages for creating a budget, tracking students, tracking supplies, exactly where I get supplies for my workshops, an expense report page and much more! Click here to learn more about the guide, or simply purchase it directly by clicking the “Add to Cart” button on the listing.